As I look back on 2009, it was a wonderful year for me creatively. I had the opportunity to design for some wonderful companies (some new, some I've worked with in the past), I reached a few creative goals I set for myself, and saw that work pay off having my creations published in various magazines, for this I'm grateful! Sticking with the Bloggers Challenge Celebration Theme, I created a Happy Birthday card for the New Year! I found this great pattern paper from Basic Grey - Euphoria that reminded me of fireworks! 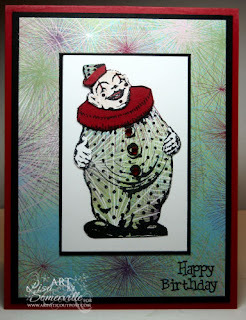 I used the paper for my background and to paper piece the clown from the Artistic Outpost Send in the Clowns plate. I did also add a bit of Red and White (face/hands) card stock for additional paper piecing. Looking for more inspiration, click on the Bloggers Challenge Logo on my sidebar to see what the other challenge members created. Wishing you all a creative 2010! Perfect! and I thought I read somewhere you lost your MoJo. Don't look like it. This card is great and I agree that paper is great too. Happy new year my friend. Wow Lisa! Just beautiful! I just love that clown and your colors are perfect! Happy New Year! I love your card- perfect for Celebrating. You should be so proud of your accomplishments and I hope you know how much I love your talent and inspiration! Happy New Year! Very cute! I do like that paper! Happy New Year! Great card, Lisa, that background paper is awesome! Wishing you all the best in the New Year! That is fabulous paper! I thought that maybe it was a new tech! Super card...fabulous colors! Happy New Year!!! Happy New Year! That basic grey paper is one of my favorites! Put a happy face on me for a Happy New Year! reat card! Very cool card! Love that paper you found! This is just gorgeous. Happy new year! Fantastic card Lisa. Love the Clown image. The DP you used is perfect. - I look forward to seeing what you create in 2010. CUTE! Love the paper piecing! Lisa, What a great way to start the new year....looking at a card you made. Great design, Lisa! Love the paper piecing on the clown. Happy New Year!